Do you experience frequent ragging and blocking issues in your pumping process? Mono has the solution to this disruptive time-consuming and costly problem with our easy-fit, de-ragging Muncher package. 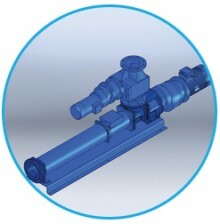 The Muncher is mounted directly onto your new or existing progressing cavity pump to macerate rags or fibrous material. Significant cost savings are offered in terms of maintenance call outs, downtime and spares usage when addressing ragging problems.